Fact #1. The Megalodon Shark Was The Largest Predator That Ever Lived. Reaching lengths of up to 60-70 feet and an estimated maximum weight of over 60 tons, the Megalodon is the largest known predator in Earth’s history. The modern Sperm Whale is longer, but probably not as heavy as the Megalodon. To compare this size, the largest modern Great White sharks max out around 23 feet and 3 ½ tons. 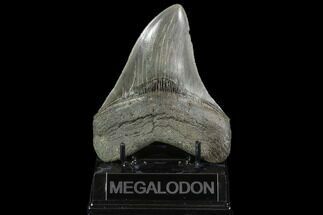 This makes the Megalodon nearly 3 times as long, and 20 times and heavy as the Great White Shark. Because shark skeletons are made of cartilage that doesn’t fossilized easily, scientists just have the teeth to go on when estimating maximum size. 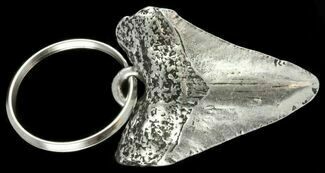 This has caused a wide range of maximum sizes to be proposed over the years, depending on the methodology used, but most scientifically accepted maximum sizes fall in the 50-60 foot range. 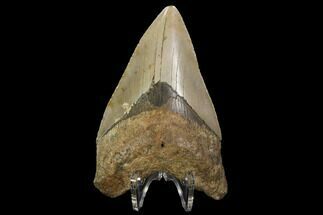 While most adult Megalodon teeth fell into the 4-5” size range, a few massive, fossil teeth have been found in excess of 7” The largest verifiable Megalodon tooth is a 7.48” tooth found near Ocucaje, Peru. 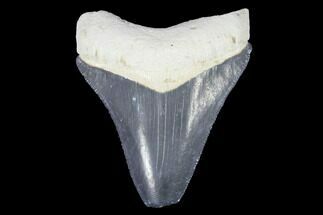 Compare that to the Great White shark whose teeth reached a maximum size of under 3 inches in the largest individuals. Reconstructions of the Megalodon’s jaw suggest they may have been up to 7 feet across. 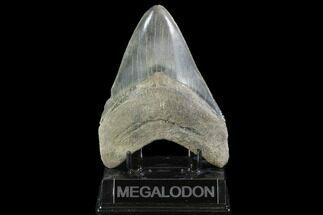 Contrary to popular belief, fossil evidence shows that the Megalodon is NOT in fact closely related to the Great White Shark. 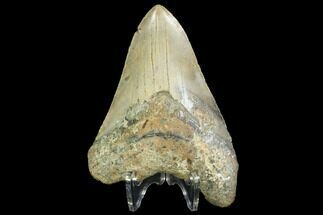 When the Megalodon was first described based on fossil teeth in 1843, it was put in the same genus as the Great White shark, Carcharodon . 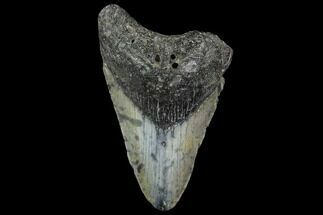 They both had big, serrated teeth and were the marine apex predators of their time. So they must be related, right? 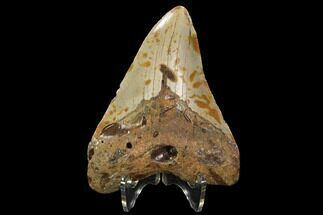 But, as our understanding of shark taxonomy has grown and new fossil discoveries have filled gaps in the fossil record, it’s become apparent this assumption was not correct and a new Carcharocles genus was created. 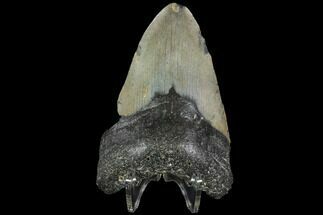 The Megalodon likely represented the end-point in a chronospecies, or a single evolutionary line that can be traced back nearly 60 million years to the Otodus shark. At the same time the research has shown that the Mako Shark and Great White Shark and closely related. 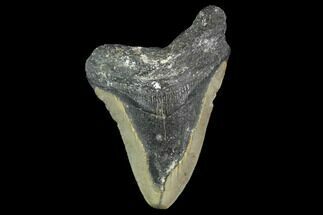 Fossils show that they both likely evolved from the extinct Broad Tooth Mako (Isurus hastalis), branching off about 5 million years ago. 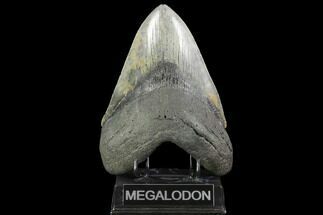 So, while popular media often represents that the Megalodon and Great White are closely related, that statement doesn't match the fossil evidence or the consensus view among researchers. Many fossil whale bones have been found with clear signs of large, bite marks made by teeth matching the Megalodon’s Other excavations have found Megalodon teeth lying next to the chewed remains of whales. 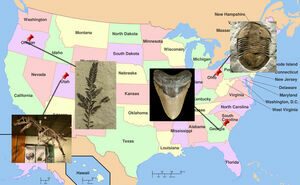 Surprising to some, fossil Megalodon teeth are relatively common fossils in many areas of the world. 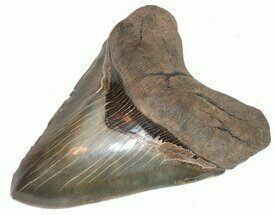 Like other sharks the Megalodon lost it’s teeth as it grew, they became worn or broken. 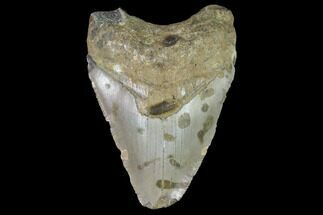 Their teeth also were very solid and fossilized quite easily. 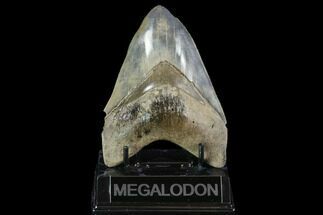 While Megalodon teeth in general can be quite common, large or exceptionally well preserved specimens can be very rare, and can fetch big bucks from collectors. 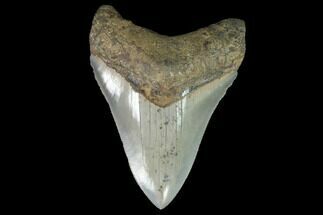 For example, 7” Megalodon teeth are so rare, the last one sold for nearly $50k, while small or broken teeth can be quite inexpensive. 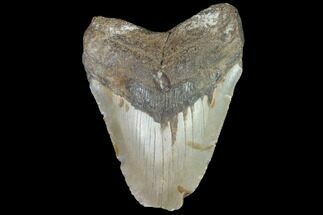 Fossil teeth of the Megalodon have been found world wide from regions including North and South America, Europe, Africa, as well as Puerto Rico, Cuba, Jamaica, the Canary Islands, Australia, New Zealand, Japan, Malta, Grenadines and India. It appears to have lived anywhere the ocean was warm enough and food sources plentiful enough to sustain it. Unless you believe a bunch of CGI, made up “evidence” and actors masquerading as scientists on the Discovery channel the Megalodon shark extinct around 2.6 million years ago. During this time, the Earth underwent significant climate changes which would have but significant pressures on the Megalodon. The Oceans cooled and sea levels dropped, and many large marine mammals which the Megalodon relied on for food disappeared during this approximate time. The Megalodon gave birth to it’s young in shallow water environments. Several suspected nursery areas have been identified based on the high concentrations of small Megalodon teeth, many only about 1 ½ inches in length. These suspected nursery areas include the Bone Valley Region of Florida, the Calvert Cliffs in Maryland and the recently described nursery in the Gatum Formation of Panama. Reconstructed Megalodon jaw showing rows of teeth that would act as replacements for damaged teeth. 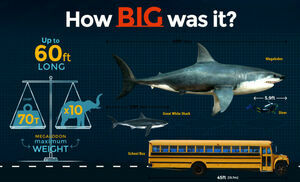 How big was the Megalodon shark? 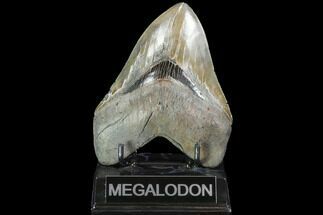 What is the largest Megalodon shark tooth? 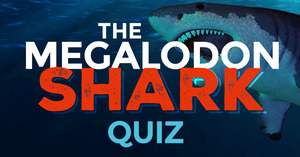 How strong was the Megalodon’s bite? 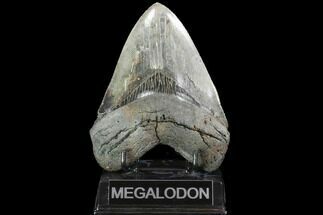 When did the Megalodon go extinct? But, could the Megalodon be living in the deep oceans? 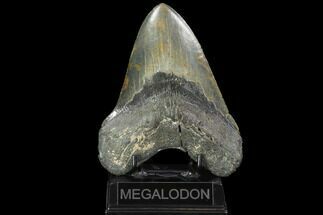 Why did the Megalodon go extinct? 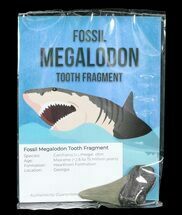 Why do fossil Megalodon teeth come in so many different colors? How many teeth did the Megalodon have? 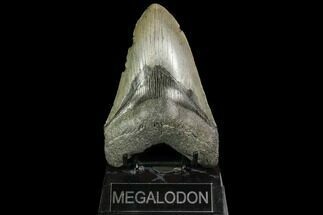 How often did the Megalodon replace it’s teeth? 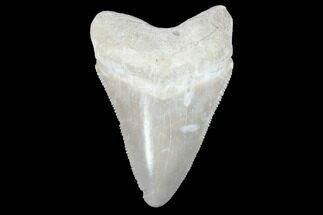 If the Megalodon was such as huge shark, why are there so many small teeth? 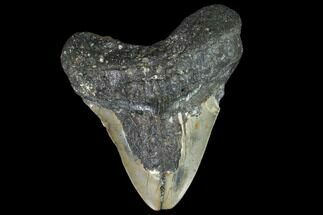 Where are Megalodon teeth found? What did the Megalodon eat? Was the Megalodon related to the Great White Shark? 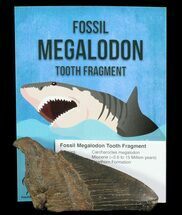 Why aren’t there fossils of other parts of the Megalodon? Is that Megalodon tooth stuck in a whale vertebra real? 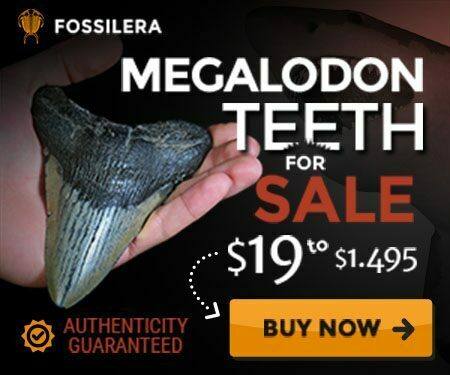 How much are fossil Megalodon teeth worth? 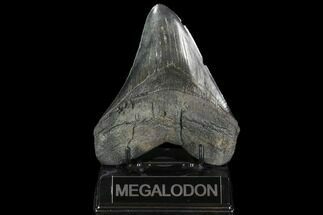 Since a skeleton of the Megalodon has never been found its size can only be estimated by comparing the size of its teeth and rare fossil vertebrae to modern sharks. Most recent size estimates put its maximum length between 60-70 feet and maximum weight at around 60-70 tons. Compare this to the largest, modern-day Great White shark that was 23 feet long and weighed less than 4 tons. Size comparison between Megalodon, Whale Shark, Great White shark and human. 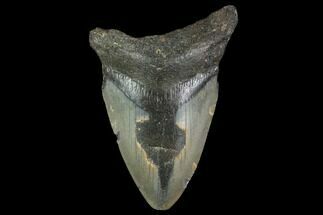 There have only been a handful of unaltered Megalodon teeth found in excess of 7 inches in length, with the largest right around 7 ½ inches long. Complete teeth over 6 inches are considered very rare finds. No, not a chance. The Megalodon was a shallow water shark that needed huge amounts of food to sustain itself, as well as shallow, warm water for nursery areas. Comparing the habitat of the deep ocean to the shallows is more of a stretch than comparing the habitats of the rain forest and the arctic. Animals that can survive in one habitat can not survive in the other. There were probably a variety of factors that contributed to it’s extinction. Around the time of it’s extinction 2.6 million years ago Earth’s climate changed drastically. The Earth was plunged into an ice age that also caused sea levels to drop drastically. The Megalodon and it’s prey thrived in warm waters, and the climate changes would have put extreme pressure on it’s food sources. 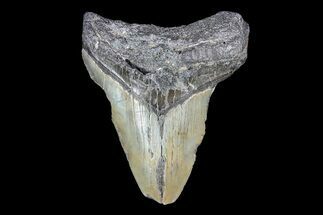 Megalodon teeth can exhibit a very wide range of colorations which are often very distinctive to the locality at which they are found. The Megalodon had 46 front row teeth, 24 in the upper jaw and 22 in the lower jaw. 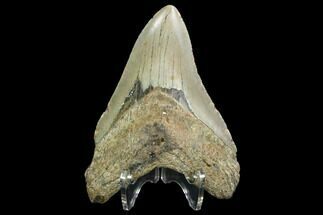 Most sharks had at least six rows of teeth, so a Megalodon would have had about 276 teeth in it’s mouth at any given time. The teeth in the back rows were replacement teeth, sliding in to replace the front teeth when they become worn or damaged. A reconstructed Megalodon jaw showing the multiple rows of teeth. 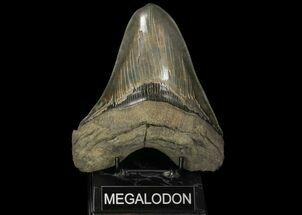 The Megalodon like all sharks replaced it’s teeth as it grew or the teeth become worn/damaged. New teeth are continually grown in a groove in the shark’s mouth and the skin acts as a “conveyor belt” to move the teeth forward into new positions. Younger sharks replace their teeth more often than older ones. 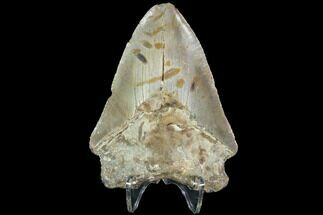 Unfortunately we have relatively little real data on the tooth replacement rates of modern day sharks, let alone a prehistoric one. 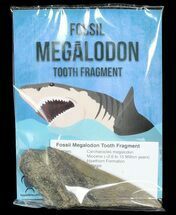 But we can safely assume an adult Megalodon would have shed thousands of teeth in it’s lifetime. 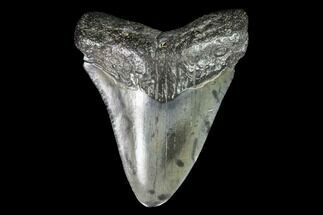 Megalodon teeth are relatively common fossils in many locations. 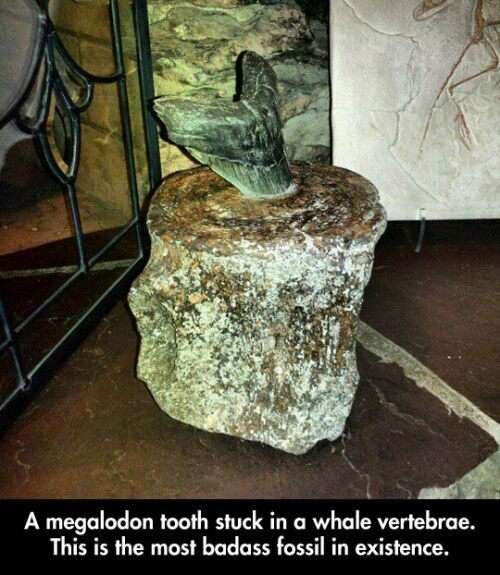 The reasons for this is that the Megalodon (and other sharks) shed their teeth during their lifetime or as they grew. 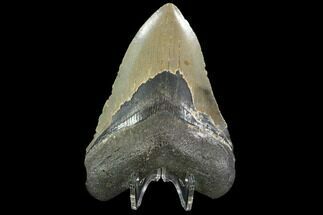 It's estimated that an adult Megalodon shark may have shed as many as 20k teeth during it's lifetime. 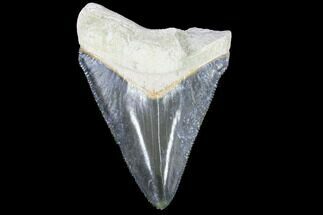 Teeth also tend to fossilize pretty easily. 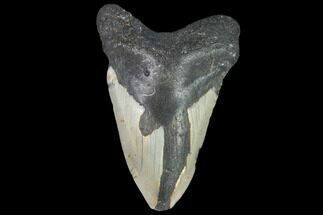 Larger teeth tend to much rarer as there were progressively fewer larger sharks than smaller ones, and the vast majority of fossil Megalodon teeth that are found are not complete or damaged. 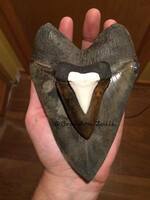 So, while Megalodon teeth are common, large, good quality specimens can be very rare. 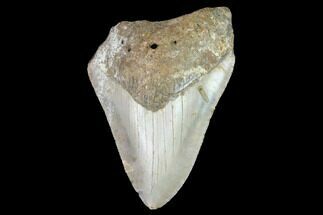 Most fossil Megalodon teeth that are found are small, maybe around 2 inches long. 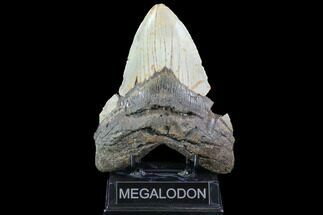 A Megalodon was not born with massive 6 inch teeth but rather shed and replaced there teeth with progressively larger ones as they grew. 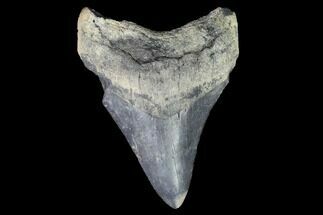 Since few sharks would have survived to adulthood, there would be far more small Megalodon teeth than large ones. 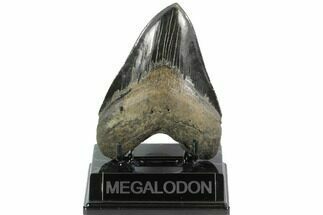 The Megalodon had a cosmopolitan (worldwide) distribution in warmer waters so it’s teeth are found all over the world. 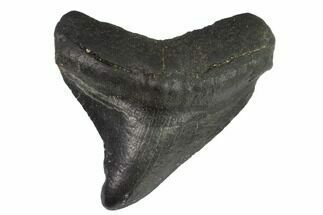 Megalodon teeth are common in much of the SE United states, Florida, Georgia, the Carolina’s, etc. They have been found on the West Coast in California. They are also well known from the deserts of Chili, the Western Sahara Desert, Cuba, and many other places worldwide. A large adult Megalodon may have required more than a ton of food EACH DAY to sustain its lifestyle. 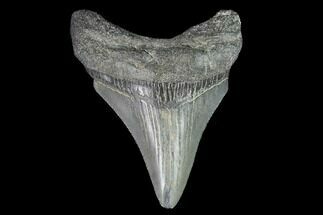 Fossil evidence indicates the Megalodon preyed primarily upon marine mammals including whales, dolphins, sea lions and sea cows. Many whale bones have been found that have clear bite marks made by teeth that match the Megalodon’s. 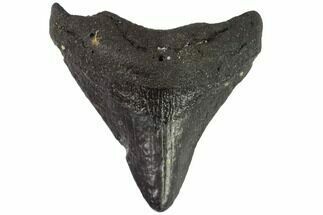 Megalodon teeth have also been found in close association with whale fossils, possibly lost during feeding. 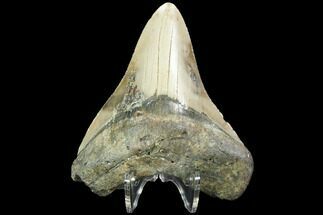 This is a topic that has been debated for years but recent research and analysis of fossils show that the Megalodon and the Great White are NOT closely related. 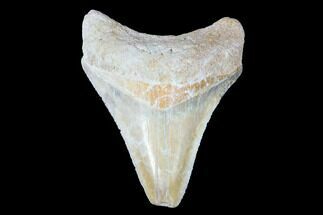 The Great White shark is closely related to an ancient shark Isurus hastalis, the "broad tooth mako", rather than to Megalodon. 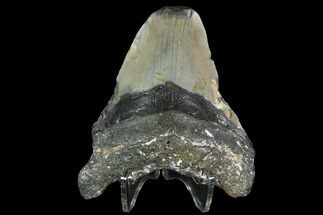 The Megalodon shark appears to be a chronospecies who's line can be traced back to the Otodus shark in the Paleocene, some 60 million years ago. 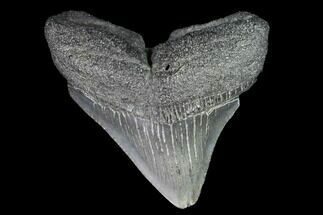 No modern day sharks evolved from, or are closely related to the Megalodon, the line simply died out. 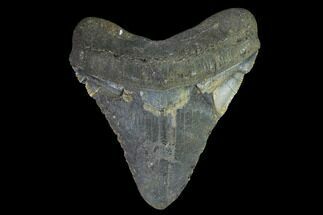 While Megalodon teeth are common fossils, other fossils material of the Megalodon is very rare, consisting of the occasional vertebra. The reason for this is that the skeletal structure of sharks is made of cartilage, not bone. 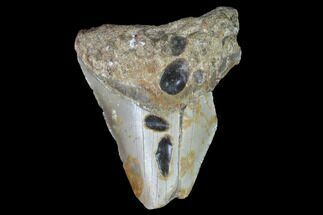 It’s very rare for cartilage to fossilize. There are several pictures of a Megalodon tooth purportedly embedded in a fossil whale vertebra floating around the Internet. 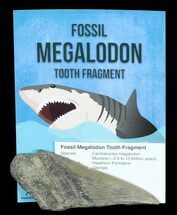 The value of fossil Megalodon teeth is highly dependent on many factors including size, condition, location found, etc. 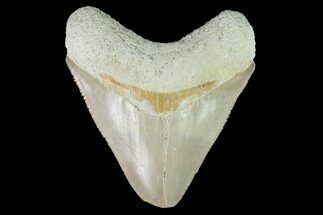 Small Megalodon teeth or Megalodon teeth with defects are common at some locations and thus don’t have much commercial value. Large teeth with few defects, teeth with unique coloration or from locations where they are rare can fetch thousands or even tens of thousands of dollars from collectors. 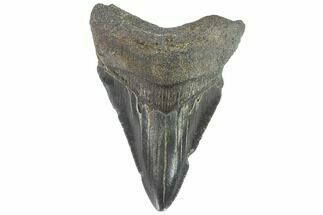 You can read more about Megalodon teeth pricing here, or check out our selections of fossil Megalodon teeth for sale ranging from about $10 to over $1k.